Reminder advertisements are identified as an exemption to the advertisement regulations, including provisions to provide a brief summary. Reminder advertisements " . . . call attention to the name of the drug product but do not include indications or dosage recommendations for use of the drug product. . . . and, optionally, information . . . containing no representation or suggestion relating to the advertised drug product." Reminder advertisements cannot make a representation about the product or suggest a use for the product. 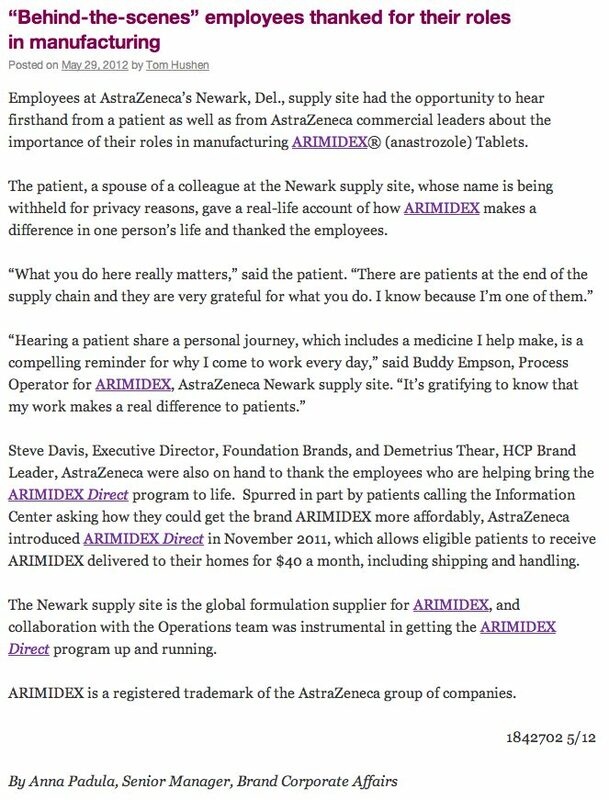 The AZ Health Connections post does "call attention to the name of the drug," but it also directs readers to ARIMIDEX Direct, which is a program that "allows eligible patients to receive ARIMIDEX delivered to their homes for $40 a month, including shipping and handling." Sounds like a good deal, although I did not investigate what the eligibility requirements were. AZ, I believe, is a signatory to these voluntary guidelines. Since these guidelines only apply to TV advertising, AZ is not in violation. It's still the "wild west" on the Internet with regard to reminder ads; i.e., It's perfectly fine to run "reminder ads" on the Internet. This is usually the case when pharma companies buy Adwords (paid search ads) from Google, especially after the FDA came down on Adwords that included the indication with the brand name. 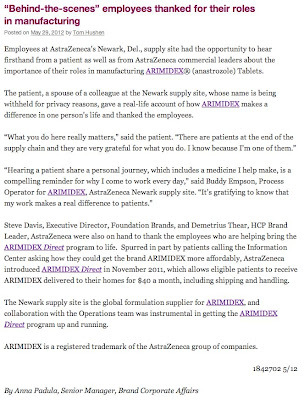 The #4 (or #3, depending on how you count) search result leads you to the home page of the www.arimidex.com Web site. 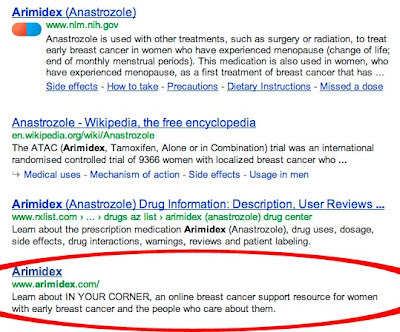 Note that the search result looks like an ad with copy that mentions the indication of the drug: "Learn about IN YOUR CORNER, an online breast cancer support resource for women with early breast cancer and the people who care about them." Google mindlessly reads the META NAME tag to display the description of the site in the search result. The information contained in that tag, of course, was written by AZ with the full realization that a Google search will include it in the search result. From there, it is only necessary to ensure that the site gets good placement in the natural results list and BINGO! You've got a branded "ad" that mentions the drug name and the indication WITHOUT the required ISI. P.S. 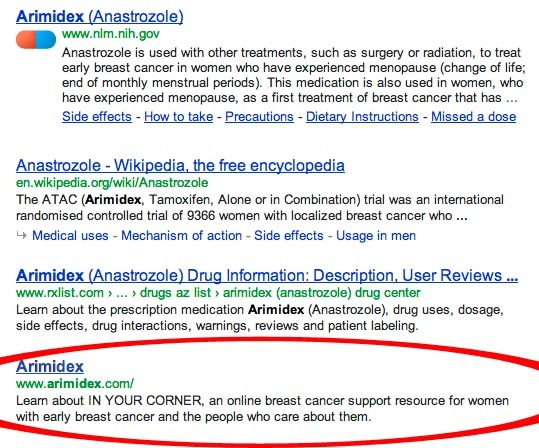 The Arimidex search result shown above may actually be what's called "paid inclusion," which refers to a sponsored "organic" search result (see, for example, "Paid Inclusion: Too Hot for Pharma Marketing?"). Thanks for pointing that out. It should read "ARIMIDEX Direct." I guess the programers have not caught up with the PR and marketing folk who have coined the new name, which is BRANDED as opposed to "IN YOUR CORNER," which is not. AZ seems to be focused on increasing their drugs' brand awareness in the social media realm.